Hair products your boy is going to want to steal - from Osis+, Kevin Murphy and Surface - so watch out! I admit it, I make a habit of using products that either come in girly packaging or smell so feminine that there is no way that it will suddenly disappear from my bathroom and appear in my husbands' - so I worry when I use products that have such obvious unisex appeal if they will even be where I left them the next day. 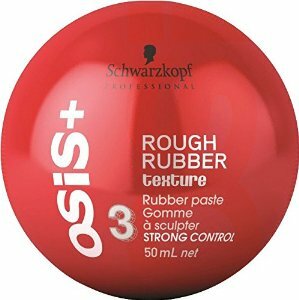 Schwarzkopf Professional Osis+ Rough Rubber Paste - 50ml - $21.50 - a revolutionary rubber paste for lasting rouged up natural locks with mould-able texture, strong control and a strong matte effect. Just apply a small amount and work it into the hair, dry or damp - then roughen up at will. Coolest packaging ever - the container is actually round! It does come with a little plastic base though if you don't want it rolling around your counter. Available at partner salons across Canada - check out www.schwarzkopf-professional.ca to find one near you. Kevin Murphy Un.Dressed Fibre Paste - 100g - $35.95 - a firm elastic paste infused with black pepper, honey and ivy extracts that creates a loose, undone, natural look with flexible hold and a matte texture. It's easy to use, just rub a small amount between palms and distribute evenly through damp or dry hair. Available at salons across Canada - go to www.kevinmurphy.com.au to find a location near you. Surface Taffy Whip Styling Taffy - 118ml - $28.95 - with a 100% humidity proof formula containing natural mushroom, corn and sugar fibres that help texturize and sculpt and can be used wet and dry on curls to set a beautiful rubberized spring curl or used dry in short hair for texture. Best part is the scent - a blend of lavender and vanilla bean, which sadly doesn't smell as girly as it sounds so you are still going to have to guard it - just remember that little bit goes a long way, especially if you are applying to dry hair - so don't overdo or you'll end up with a sticky mess! Available in salons across Canada - check out www.surfacehair.com to find one near you.